Introduction: The thoracoscopic-laparoscopic approach to esophagectomy with a cervical anastomosis has been described; however, the literature is limited regarding the feasibility and safety of performing a minimally invasive Ivor Lewis esophagogastrectomy with construction of an intrathoracic anastomosis. The aim of this study was to review our results of patients who underwent minimally invasive Ivor Lewis resection. Methods: The charts of 105 patients who underwent laparoscopic-thoracoscopic Ivor Lewis esophagectomy were reviewed. Main outcome measures include operative time, blood loss, length of intensive care (ICU) and hospital stay, conversion rate, morbidity, and in-hospital or 60-day mortality. Results: Indications for esophagectomy were esophagus carcinoma (n=82), proximal gastric carcinoma (n=9), Barrett’s esophagus with high-grade dysplasia (n=5), benign disease (n=5), and esophageal stromal tumor (n=4). The stomach was used as the conduit in 99% of cases. The mean age was 64 years. Mean operative time was 197 ? 73 min. There was 1 conversion to open laparotomy. Mean ICU stay was 4 days (range, 0-37) and mean length of stay was 10.4 days (range, 5-57). Surgical margin was microscopically positive in 1 patient. Anastomotic leak occurred in 12.4% of cases. Late complications were seen in 26% of patients with the majority being anastomotic stricture. The in-hospital or 60-day mortality was 3.8%. The mean number of lymph nodes obtained was 21.4 ? 11.3. With a mean follow-up of 21 months, 2 patients had abdominal wall metastasis in conjunction with distant disease. 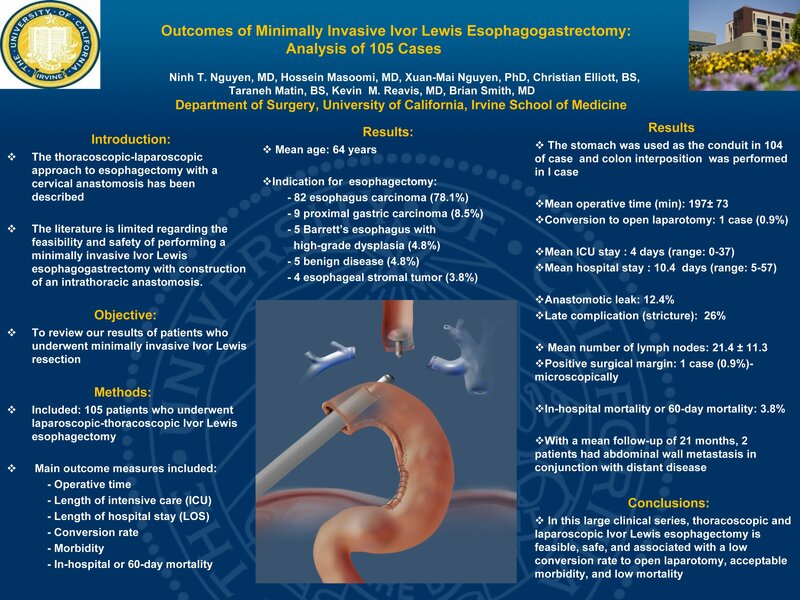 Conclusions: In this large clinical series, thoracoscopic and laparoscopic Ivor Lewis esophagectomy is feasible, safe, and associated with a low conversion rate to open laparotomy, acceptable morbidity, and low mortality.